In Greek mythology Zeus, the most powerful of the Olympian gods, was the master of the thunderbolt, Cyclops the men of the golden race gave him the weapon. In yesterday’s Tyrells Premier semi final between Harlequins Ladies and Loughborough Lightning, at Twickenham Stoop, the away side produced some glorious flashes, but it was Quins that provided the thunder that ultimately won this contest. Their line speed, and defensive brilliance constantly drove back Lightning, Khadidja Camara. the Quins centre had more hits than Take That, she tackled everything that came her way. 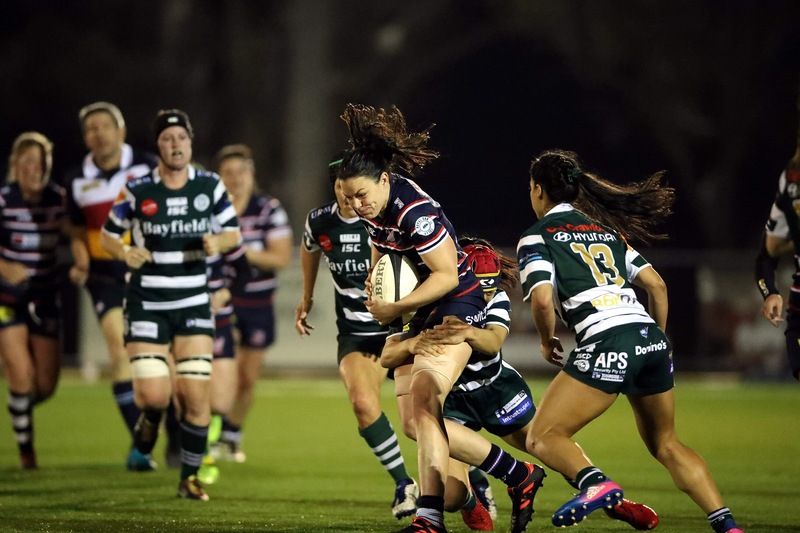 If there were to be a Greek goddess of back row forwards then Jade Konkel would fit the bill perfectly, scoring two tries, battering the gain line constantly, and she came off the field exhausted and battered justifiably won the player of the match award. At full time the teams looked absolutely shattered, both sets of players had given absolutely everything, Hypnos the greek god of sleep was not be required last night. 1,265 turned up on a cold afternoon at the Stoop, it appeared that another greek god, Boreas, the god of the north wind, had provided an icy accompaniment to proceedings, but it didn’t take long for things to warm up on the field of play. Quins scored first through Jade Konkel in the 4th minute, two minutes later Carys Williams, who looked dangerous throughout scored a sparking try for Lightning to levels the scores at 5-5. Jade Konkel got her second try on 38 minutes, and an Ellie Green conversion gave Quins a 12-5 lead at half time. Twelve minutes into the second half Vickii Cornborough powered over for a try converted by Ellie Green, and on 69 minutes Leanne Riley’s quick thinking earned her a well deserved try once again the conversion was supplied by Ellie Green. This was a clash of the titans, the physical contest was immense and the hits ferocious, both sides suffered injuries and at one stage the pitch resembled a battle field, we can only hope that Apollo, the greek god of healing will assist to ensure Quins are at full strength for the final in two weeks. Quins now face Saracens in the final, at Franklins Gardens, on April 27, a repeat of last years final, it may well be worth getting in touch with Fortuna, the greek goddess of good fortune, it certainly can’t do any harm. When you come across someone who has all these qualities by the bucket load, its makes you realise that this great game of ours is well and truly blessed. Harlequins and Scotland lock, Deborah McCormack is one such individual, and to say that she has had a testing season would be a massive understatement. Following last years final against Saracens, Debs headed south to spend the summer of 2018 playing for Eastern Suburbs in Sydney, Australia, a stones throw from Bondi beach, she returned to native soil in peak physical condition and champing at the bit to start the new Tyrrells Premiership season. On the 8 September, in the opening match of the current campaign, she injured her shoulder, an injury that didn’t initially appear to be of a serious nature, sadly it proved difficult to diagnose and kept her out of action for club and country for the best part of five months. The down to earth popular lock, as is her way, bore her injury with humour, and good grace despite constant set backs, stuck on twenty eight Scotland caps, she missed the entire Autumn international series, and finally returned to Quins action on January 26 in the away victory at Wasps. An integral part of the Scotland set up Debs was called Six Nations into action to face Ireland with just one half of rugby under her belt, she played a lung busting forty one minutes at Scotstoun before being replaced having emptied the tank. She finally got her 30th cap against France in Lille on a balmy February Saturday night in Lille, before adding to her tally against England at Twickenham in the final match of the championship. In the game changer at the Stoop, two weeks ago Debs joined the fray in the 61st minute, as a replacement for Chloe Butler, and it only took her sixteen minutes to get her first try of the season. But we should know from experience that come the business end of the season Supermac gets into her try scoring mode. Last season she scored a try in both semi final legs against Wasps, and in the final against Saracens, we are all hoping history will repeat itself starting tomorrow , although Debs is under no illusions. Tomorrow Harlequins Ladies face Loughborough Lightning in the Tyrrells Premiership Semi Final at the Stoop. Lightning will be tough opponents they have quality in so many areas and a host of internationals at their disposal. Debs is on the bench with her old sparring partner Zoe Sayner and I wouldn’t bet against another try from our Flower of Scotland come the latter stages of an epic encounter. Like a holiday romance the time has come to pack our bags and head home to reality, the grand slam party is finally over, and we are leaving with a doggy bag crammed full of memories and images. Our Grand Slam T-shirts have been pre-ordered, and Welsh fans the world over are desperately attempting to find affordable flights to the land of the rising scrum for the Rugby World Cup in Japan. So as the paracetamol is finally put back in the medicine cupboard, it’s time to look at what happens next for Wales. It’s hard to believe that Wales last lost a game of rugby on 24 February 2018, and after fourteen consecutive wins they will remain unbeaten until at least August 11th 2019. Warren Gatland’s last match in charge of Wales is a moveable feast, (or famine), at the moment, depending on how far the men in red progress at the Rugby World in Japan. Welsh players will get four weeks off, regardless of when their season ends, then in July the Wales squad head to Flesch in the Swiss Alps living at 2,250 metres above sea level, but training at 1000 metres, the reduction in oxygen that occurs make their bodies more efficient, it is also likely to be extremely hot during July. 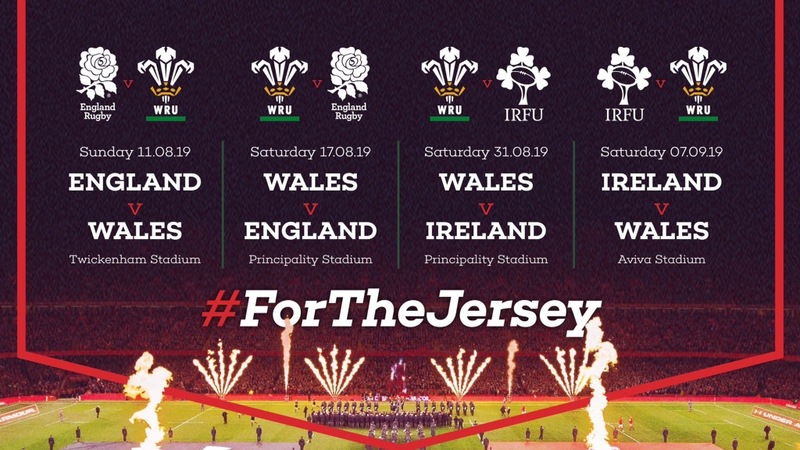 Wales then return home to face Ireland in Cardiff on 31 August after which the final World Cup squad of thirty-one players is revealed, Wales then go to Dublin on 7 September for their final warm up game. The Welsh squad depart for Japan on Wednesday 11 September to commence a five-day training camp at Kitakyushu, before heading to Tokyo for the opening World Cup pool match against Georgia on Monday 23 September in Aichi. Further Pool games follow against Australia in Tokyo on September 29, Fiji in Oita on October 9, and finally Uruguay in Kumamoto on 13 October. 1. A purple flowered Eurasian Heath that grows abundantly on moorland and heathland. 2. A try scoring machine that inhabits grassy areas capable of destroying any defence once in full flight. Heather Cowell of Harlequins Ladies is having one heck of a season. As the club prepare for a Tyrrells Premier semi final against Loughborough Lightning she finds herself the team’s top try scorer, with twenty touchdowns. Her exploits include three hat tricks one of which was achieved in 11 minutes against Bristol on 1 December 2018, touchdowns in the 21st, 29th and 32nd minute gave her the fastest hat trick ever recorded in the Tyrrells Premiership. Heather has already scored four tries against Loughborough Lightning this season, two in the away encounter, and two at Surrey sports park in the return match. Another brace at the Stoop next Sunday, in the Tyrrells Premiership semi final would be most welcome. We’ve seen many memorable days at the stoop, but this was surely one of the very best. It felt more like Tenerife than Twickenham on Saturday, as the barometer hit 20 degrees, even Chloe Butler Quins favourite Aussie was melting. A 4,837 record crowd for a women’s club game serenaded Harlequins Ladies to a 62-0 win over Gloucester-Hartbury ,a victory that guarantees them a home Tyrrells Premier semi final against Loughborough Lightning. The police dogs from the Met were there on display ,their tails wagging at this great occasion,and as for Quins, their tails were certainly up, inspired by the vocal support that reverberated around the stoop they were like a dog with a bone from the first whistle, although dogged defence from Gloucester-Hartbury kept the home side out until the 14th minute when a brilliant finish from Heather Cowell, her 20th of the season, got the scoreboard moving. They extended their lead (subtle dog reference there !) when Vickii Cornborough crashed over on 21 minutes. The tries rained a brilliant in and out from the Chichester Express Jess Breach allowed her to race in a long range try that was so rapid it set off the speed cameras on the A317. A half time lead of 31-0 was extended on 46 minutes when Jade Konkel,the monster from the Black Isle, crashed over on 46 minutes followed by the melting Aussie, Chloe Butler on 57 minutes. A spot of walkies for Khadidja Camara and Rachael Burford, after they both received yellow cards in quick succession, did nothing to stem the Quins tide. 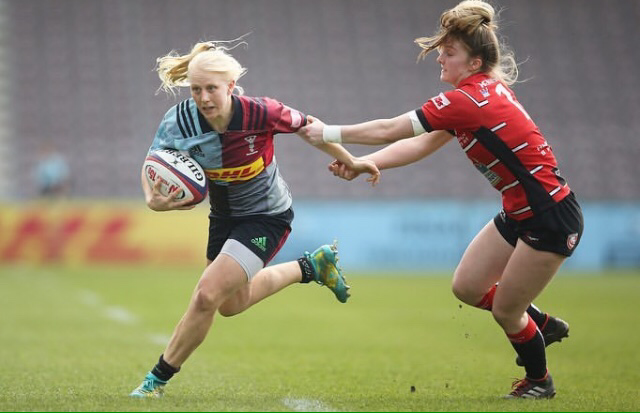 Davinia Catlin scored two tries in five minutes to take Quins past fifty points, before Super sub Deborah McCormack put the misery of an injury ridden season behind her and bulldozed over for the the most popular try of the day. Whilst the try scorers grab the glory the metronomic boot of Ellie Green notched up 13 points through a penalty and five conversions, her incredibly consistant performances continue to be a major factor in Harlequins success. As the Met Police Alsatians headed for their tea, Winalot would appear to be something that they have in common with Harlequins Ladies…..Bon appetit everyone. A young boy swathed in a red and white scarf his eyes wide with wonderment was firmly grasping his father’s hand as they walked slowly almost dazed down Westgate Street, after an epic game of rugby between Wales and Ireland on Saturday. His face was pale and drawn with the emotion of it all, once he regains his strength, this will be a day he will remember for the rest of his life. Most Welsh rugby fans will have a similar memory, and how lucky are we to own such a wonderful treasure, my generation have the seventies 71, 76 and 78 when we first experienced that wonderful sensation of a Welsh Grand Slam. Our cranial YouTube channel can instantly recall Barry John’s broken nose, JPR’s shoulder barge on Gourdon, and in a week when storm Gareth hit the UK, I can recall another Storm Gareth, Edwards the Knight , dropping a towering drop goal to seal a slam. That young boy who thankfully had some colour returning to his cheeks, by the time he reached St Mary street, will have a similar treasure chest to carry through his life although of course his recall will be aided by Instagram Facebook Twitter and snapchat where he can instantly re run the action. As the wind howled and the rain cascaded on to the streets of the Welsh capital he no doubt began to download the mental images that will be recalled time and time again throughout his lifetime, of Alun Wyn Jones swathed in bandages majestically striding his field of dreams, of hymns and arias and bread of heaven echoing around the stadium, loud enough to shatter his eardrums. For those of my generation who can remember every minute details of matches in the sixties and seventies, yet cannot recall why they went into the kitchen ten minutes ago, this slam brings tears to the eye, a tear for the present, a tear for the past, and a tear for those no longer here to share it with us. One thing that spans the generations is that on Saturday night, as storm Gareth rattled the window panes and the wind rustled in the trees, we all enjoyed a joyous cosy sleep only interrupted by the images of Hadleigh, Alun Wyn and the other heroes clad in red living out or our dreams. A grand slam is a wonderful thing indeed, and as Van sang “My mamma told me there’d be days like these”, but she didn’t tell us they’d be this good. In West Wales children of my generation were raised on rugby folklore, tall tales that became exaggerated each time they were told, but there was almost a reverential hush when Grand Slams and Triple Crowns were mentioned. Unlike today where every international contest has an accompanying trophy, these titles came with nothing tangible, they were the rugby equivalent of climbing Everest, the glory of the achievement was more than enough of a reward in itself. This Saturday Wales face Ireland in Cardiff, with a triple crown and grand slam within tantalising reach, the glory has not been diminished by the fact that there is now a fair bit of silverware involved. Ireland have been the opponents in the final match of four out of Wales eleven grand slams, stretching from their first in 1908 to the most recent in 2005. This fixture has so much history, so many anecdotes and has been laced with some of the greatest characters of the game. Whilst we all enjoy the earthly pleasures of this wonderful game on Saturday, I have a fondant hope that there is a small pub, somewhere in heaven, where you will find tucked away, on an old wooden corner table three pints of Guinness, being sipped slowly by Merv Mossie and Willie Duggan, three rugby giants who always answered their country’s call. Wales v Ireland has always been a very special encounter, and come the day, and come the hour, lets just hope that Wales produce the power and the glory on Saturday to win their twelfth Grand Slam.